This article reveals the entire procedures for preparing Egg, chicken, vegetable, soup and ancient Biryanies. These are easy to cook and healthier than you imagine. Choose your favorite dish and try cooking it now itself. 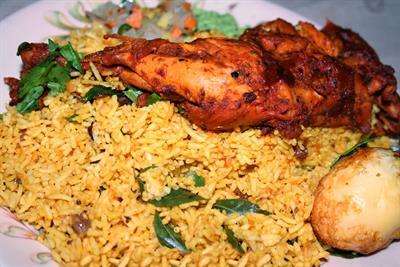 Biryani is one of the tastiest and favorite dishes of Keralites. It was introduced in Kerala by the middle-east Arabs and became popular all over the state. The word 'Biryani' was derived from a Persian word 'Berya' which means roasted or fried. Now Biryani has become an inevitable part of celebrations like wedding, party etc. 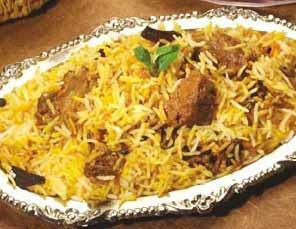 Biryani, biriani, buriyani, beryani and beriani are the other names for this dish in different parts of the state. Read below to get an idea about how to make different types of biryanies. Grind ginger, green chilly and garlic all together and cut the onion along with tomato into small pieces. Make powders of cinnamon, clove and cardamom so as to get more taste. Now take the chicken and cut it into small pieces after washing it thoroughly. Then add turmeric powder, coriander and chilly powder to the fresh chicken and mix them all together. Heat the pan, add some ghee, cashew nut and kismis to it. Make sure that it doesn't get fried over the limit. Once it is done, keep it aside. Then add tomato, ginger, green chilly and garlic along with salt and half cinnamon, clove and cardamom available. Add chicken into it and mix it properly. It should not get over cooked. Now we should prepare rice for the biryani. For that, pour water into a large vessel and allow it to boil, then add proper salt and washed rice into it. Turn off the gas when it gets half cooked. Now add the cooked rice slowly onto the chicken masala prepared and spread coriander leaf and cardamom after pouring some ghee. Close the lid and heat it for 20 minutes in low flame. When it is ready then mix the rice and chicken masala all together and spread the kept aside cashew nuts and kismis for the final touch. Your chicken biryani is ready to be served. If you want to prepare a Mutton biryani then use the same weight of mutton in place of the chicken. Allow the meat to get soaked completely in curd, crushed kismis and salt for 2 hours. When the onion is fried in ghee, add clove, cinnamon, cardamom, garlic slice and thin pieces of ginger all together to fry it up again. Mix the mutton and coriander leaves into this thoroughly and keep it in a container. Cover the container using a hollow lid which can contain water. Now add some water into the lid and very little to the mutton so as to steam it. When the mutton is almost cooked up, pour out the remaining water in the lid. To this mutton curry, add green chilly. Finally pour some lemon juice and mix it well. Now it is time to make rice for our biryani. For that, leave biryani rice in water for 1/2 an hour. Cook that rice appropriately without messing it up as rice is the backbone of biryani. Strain off all the water content in the rice and pour ghee according to your taste. Now move the curry into a plate which is slightly soaked up with ghee and add rice onto it. You can also use food color to add to its attraction. Cover the biryani with wet towel and close it with the hollow lid. Bake this rice using coal or electric stow for 1/2 an hour. Now you have the ancient biryani in front of you. Cook all the items given in the 2nd ingredient in a pressure cooker and extract its soup from it. Now fry up onion, kismis and cashew nut in hot vanaspathi and move it to another plate. Add washed rice into this vanaspathi and slightly fry it. Take 5 cups of soup to which turmeric powder is added and pour it to the rice to start cooking. When water is almost dried up, take it for baking in the electric stow for few minutes. Rice should be placed in a flat plate and the fried ingredients should be spread onto it. Now your soup biryani is ready to use. Impress your mates with this special biryani recipe. Take a plate which has a strong and wide base for heating the oil. Add onion to it and stir it continuously until it gets a brownish-red color. Also fry cashew nuts and garam masala for 1-2 minutes and keep it aside. Take the washed rice after frying it for 5 minutes and add water and salt for further cooking by keeping it in an air tight container. Then mix the garam masala with lemon juice and pour it onto the cooked rice. Take the cashew nut, onion, egg and saffron mixed milk and spread it over the rice for final decoration. If needed you can cut the eggs into pieces and add to it. 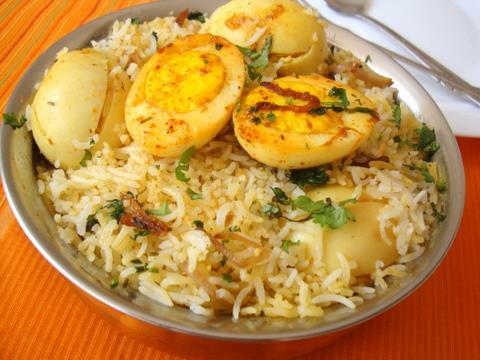 Now you have your egg biryani ready in front of you. Serve it before it gets cold as its taste is at the zenith when it is enjoyed just after cooking. Wash the rice and green peas thoroughly and boil some water in a container. Add some ghee into the pressure cooker or a plate having thick bottom and add rice into it to fry it slowly. Now add green peas, salt to taste and some water and stir it well. Close it with the lid and cook further. When the entire water dries up, rice should be perfectly cooked. Keep the crushed garlic and ginger aside and make the tomato, onion and green chilly along with other vegetables into small pieces. Steam all the above and wait till it gets dried up. Then fry it slightly using 1 teaspoon oil and the onion and green chilly using 3 teaspoon oil. Now add the crushed and powdered items along with tomato into it and stir well. Cook this under sim flame for five minutes. Off the flame, add 1pinch garam masala, curry leaves and one table spoon coconut milk into it. Add 1/3rd of rice into a plate spread with ghee. Add the rest of the rice along with vegetables and ghee after few minutes. Spread some coconut oil and garam masala on the top and press it gently. Finally bake this in an oven for few minutes. Now you can serve your vegetable biryani after spreading some coriander leaves for decoration. It can be best served with a 'curd patchadi'.